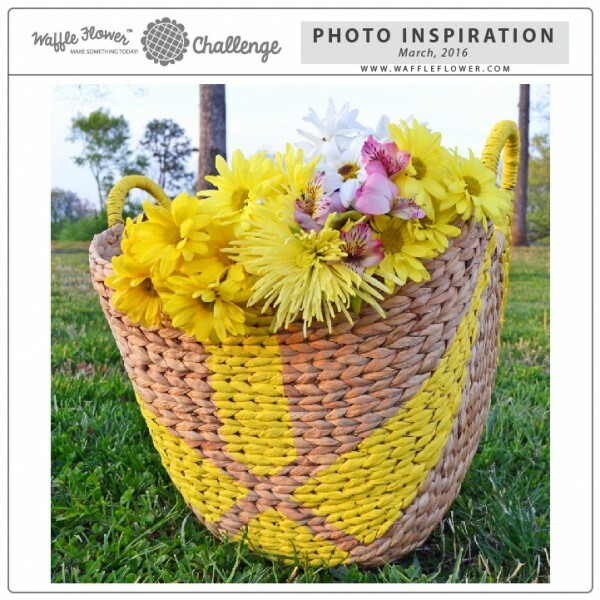 I'm playing along with the Lawnscaping Challenge: Sweet. 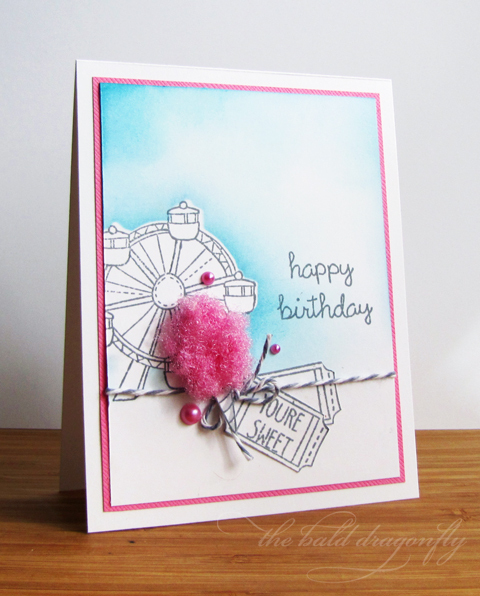 I started by masking out the Ferris Wheel from Admit One and inked a soft blue background. I then stamped the ferris wheel, and some tickets and cotton candy that were fussy cut out. 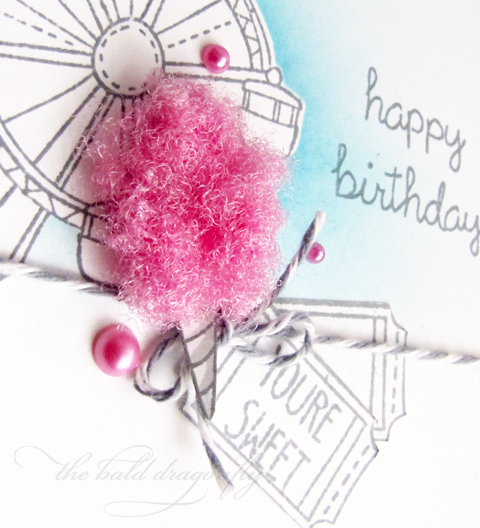 I added some May Arts Fuzzy Pom ribbon to the top of the cotton candy wand. 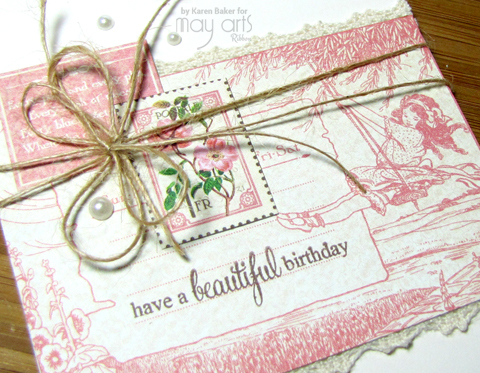 I finished the card with a stamped sentiment, a baker's twine bow and some pink pearls. I'm playing along with Papertrey Ink's Make It Monday #243: Ink Blending Over Heat Embossing. 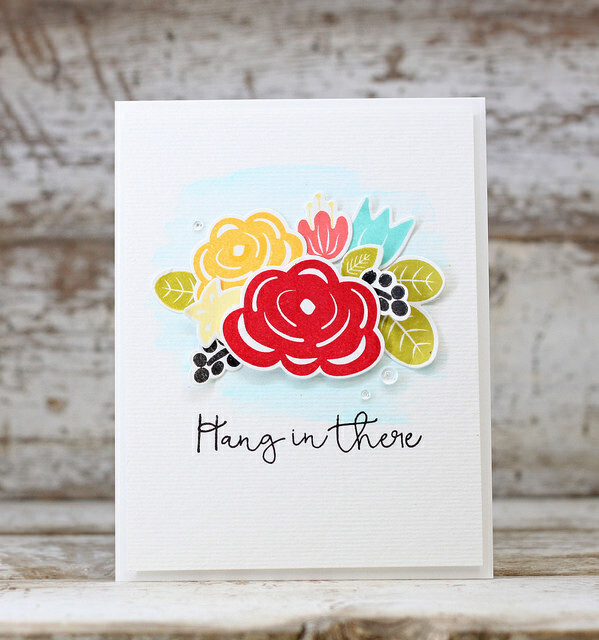 Since I already had the In Bloom Stamp Set out from the PTI Blog Hop, I challenged myself to use the images in a way that I haven't. 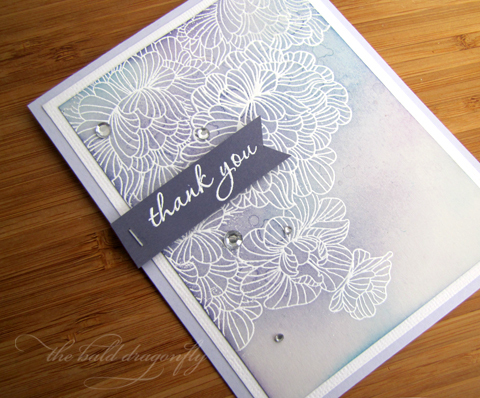 I stamped and heat embossed in white the blooms only (with a bit of masking) onto a Stone Gray Cardstock panel, then added purple and blue ink over the top. 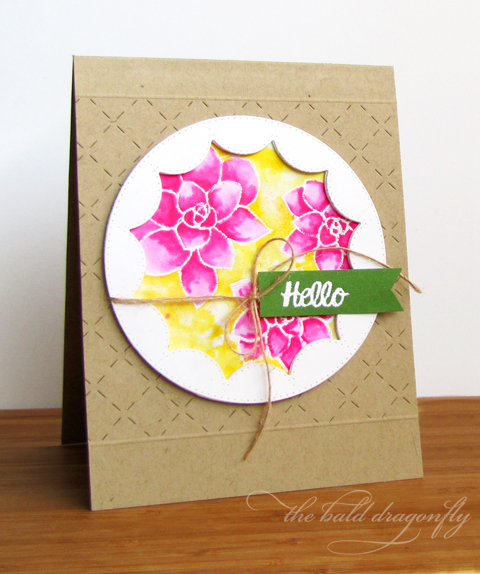 I mounted this onto a white linen panel, and it all then went on a light purple card base. 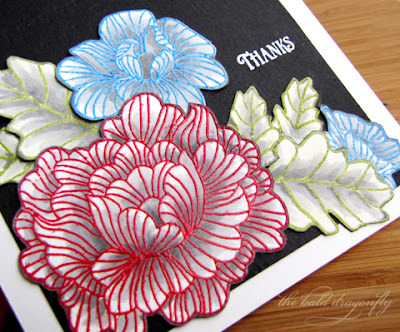 I finished the card with a heat embossed sentiment from Communique Curves, a staple and some silver rhinestones. Papertrey Ink showcased some works of art by Izziyana Suhaimi, who merges the art of embroidery with paper, to be inspired by for the Papertrey March Blog Hop Challenge. I kinda went a different route and didn't use a stitch of thread-because my supply consists of white and black, but was inspired none the less. 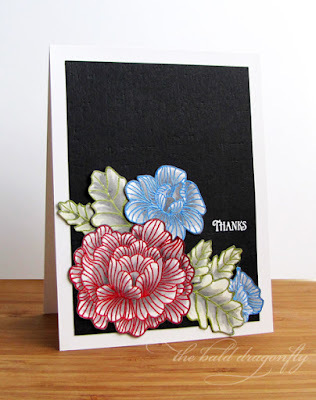 I started by embossing various blooms and leaves from In Bloom with primary colored embossing powder onto white cardstock, then filled in some areas with shades of gray. 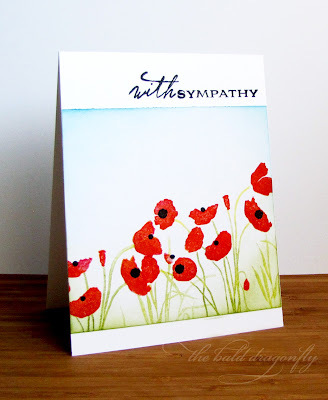 I fussy cut and mounted the flowers onto a black cardstock panel (impressed with the Linen & Canvas Impression Plate) and white embossed a stamped sentiment from Lovely Layers, this panel was then mounted to a white card base. Even though there is no stitching, I feel like I was still able to capture the uniqueness in the artist's original work. We are all inspired differently, eh? This first card features a patterned paper panel bordered by two pieces of 7/8" Ivory Crocheted Lace. I simply trimmed one piece that was 4.25" long, and then separated the piece right down the middle with scissors. I stamped a sentiment, added a few paper embellishments and pearls and then finished the card with a double bow made from my favorite trim for cardmaking- Natural Burlap String. 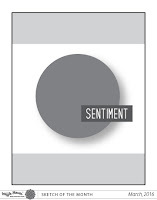 My next card features many of the same elements, so the two could be packaged together for a card pack. 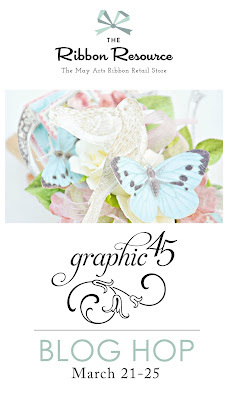 I cut out a few patterned paper strips from Graphic 45's Children's Hour and bordered it with the 7/8" Ivory Crocheted Lace, Natural Burlap String, as well as 1/4" Moss Silk. I finished the card with a few other cut paper images and pearls. 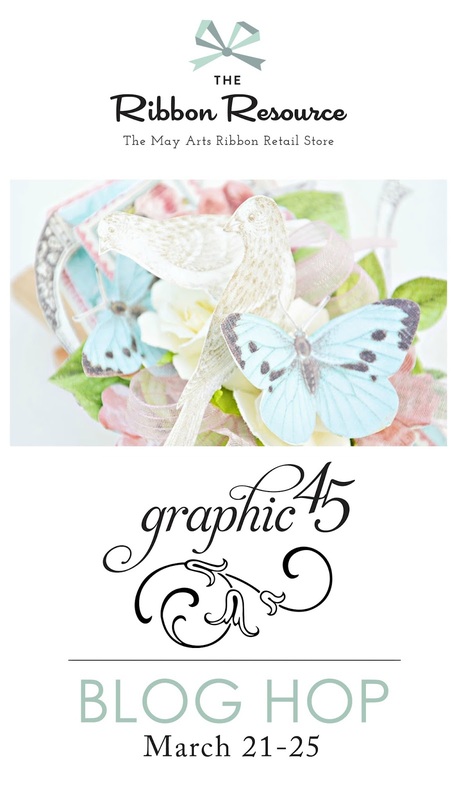 There are so many ribbons and trims at The Ribbon Resource that are a perfect match for any vintage project! Please be sure to stop by The Ribbon Resource Blog to enter for your chance to win! 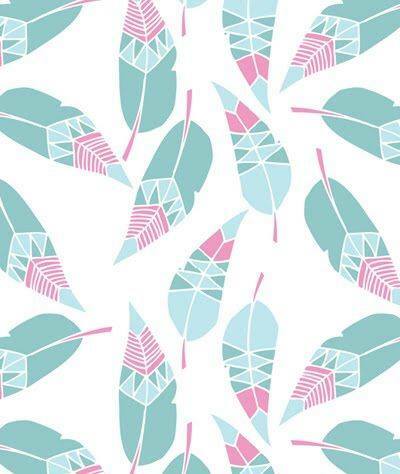 There is three $25 gift cards to The Ribbon Resource up for grabs! My coffee of choice is flavored, black, and strong. 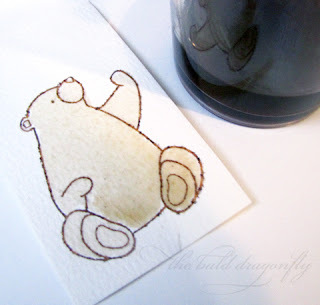 I usually do have a bit of leftovers that end up getting dumped the next morning, but today I decided to use the wonderfully fragrant (coconut caramel), wonderfully black leftovers to paint my soft and cuddly bear. 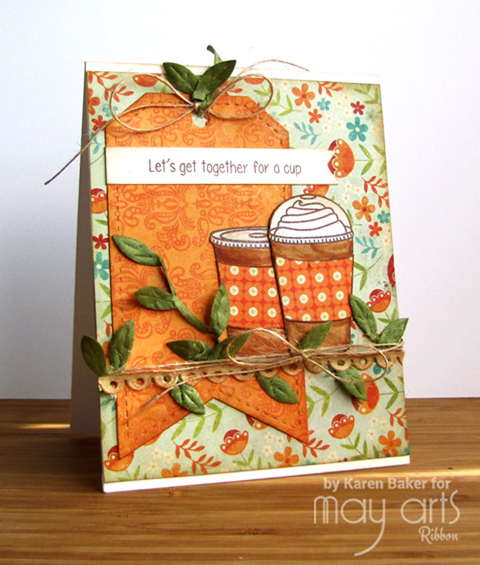 I have (what I think is) my last card for the Spring Coffee Lover's Blog Hop. I started with a light wash of coffee onto watercolor paper. I had attempted this a couple of time, until I realized that the coffee couldn't touch the ink so the ink wouldn't bleed. I dried the coffee between layers, building up the caramel color. 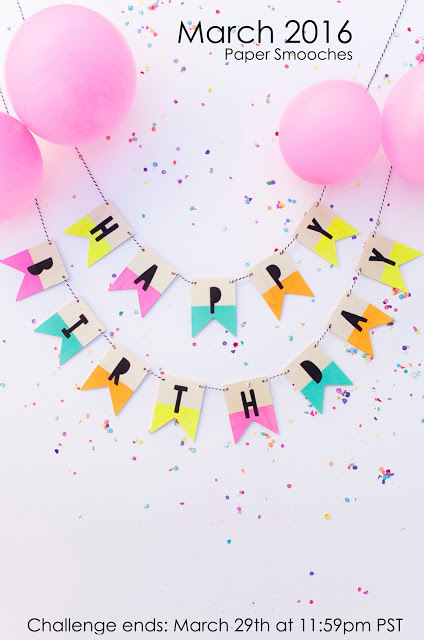 I finished the card design by coloring some balloons with Zig Markers based on the MFT Color Challenge 41, and a sentiment. 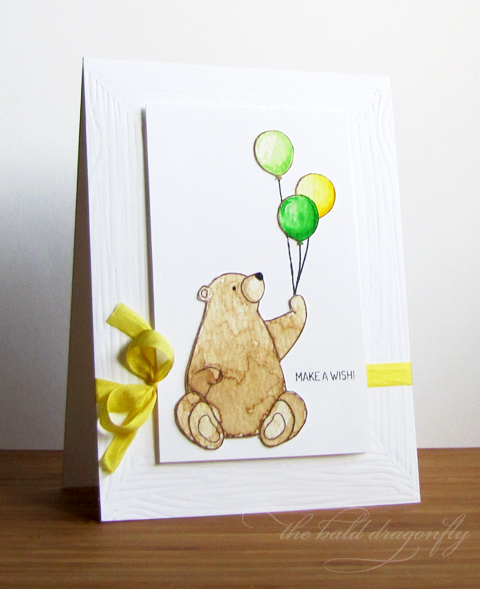 I popped the bear panel with foam dots and adhered to an embossed card base that had been wrapped with a light yellow silk ribbon. And yep! The card does smell deliciously like Coconut Caramel Coffee! 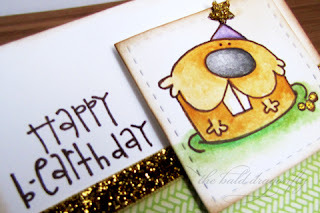 I'm joining Simon Says Stamp Wednesday Challenge: Cute and Cuddly. Carrot Cake Coffee...I would drink that! Does any place sell it? Joining in on the Spring Coffee Lover's Bloghop. Wow, so much inspiration! I started my card by stamping some coffee cups with white ink onto a kraft panel and then adhered that to a white card base and wrapped some Natural Burlap String on one side. The MISTI is a must have tool, I say! 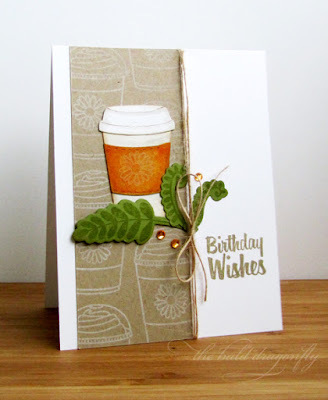 I then die cut and created another coffee cup and adhered that to the card with some die cut and stamped greenery. 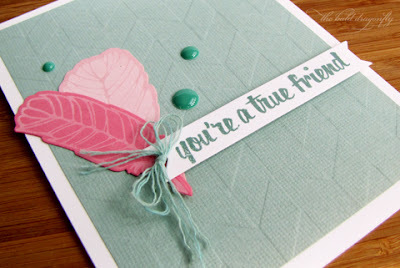 I finished the card with some orange rhinestones and a stamped sentiment. 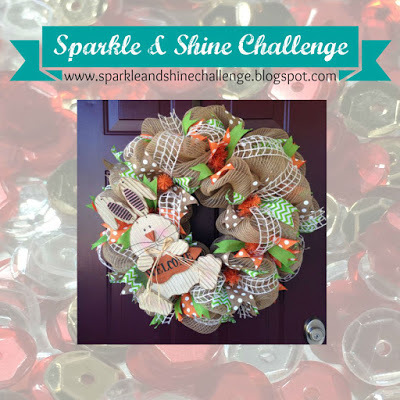 I was inspired by the colors and textures in the picture over at Sparkle & Shine Challenge #26.
just announced their new challenge for this week: Food and Drink! As I was waiting for an appointment, there was a bin outside the office where someone placed pages of a past inspirational calendar. I ruffled through these pages and one struck a cord with it's design and I tried to replicate it on my card. 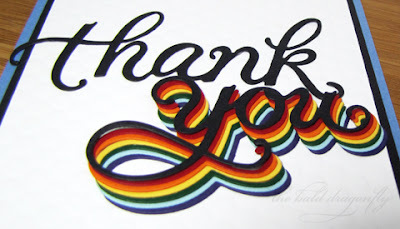 A Blog Named Hero is having a Rainbow Challenge and I used my new Thank You Die from Hero Arts to create a much need thank you card. I die cut the word in black, red, orange, yellow, green, blue and purple cardstock and arranged and adhered the "you" in a cascading fashion on a white embossed panel. After affixing the panel to a black border panel and blue card base, I finished by adding one layer of black "thanks." I'm linking this up to Right at Home's National Craft Month Celebration too...so happy that I got to play with a new and fun product! I'm so excited for the first day of Spring! I am awaiting for the ground to dry slightly so I can determine what the weeds vs. the flowers and plants are that are peeking through the ground. 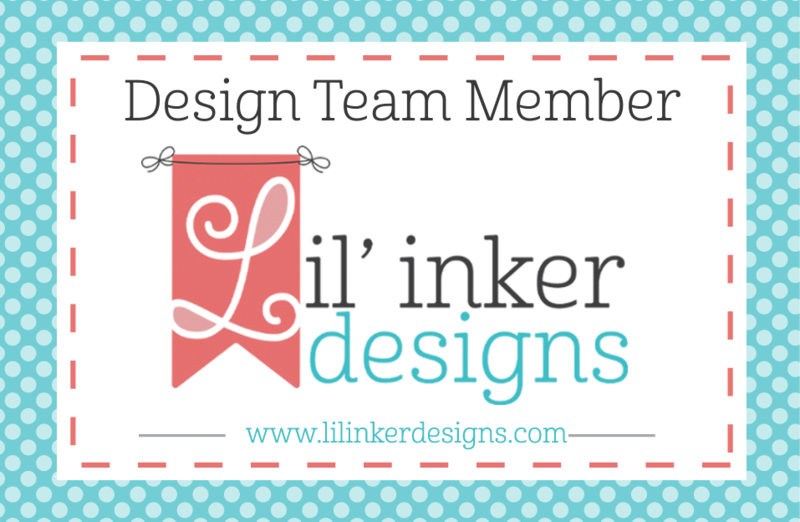 I'm playing along with the Papertrey Ink Create Along with Us: March 2016. I chose to recreate Laurie's clean, simple and stunning creation. I inked a card base lightly with blue, then added stamped, die cut blooms and leaves from Lovely Layers. The sentiment is from Botanical Silhouettes. I added some black pearls and adhered to decorated white panel on a white cardbase. 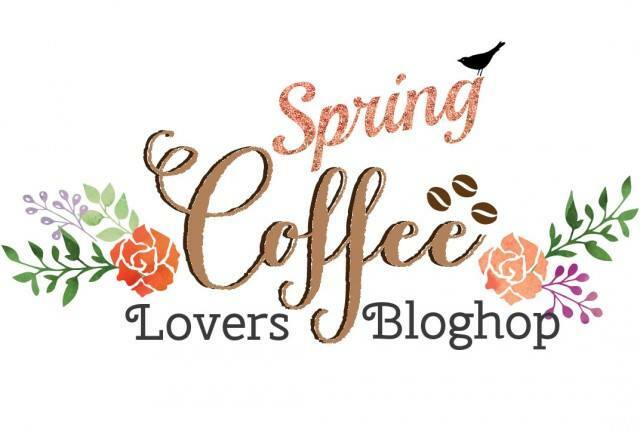 Welcome to my little stop on the Spring Coffee Lovers Blog Hop. 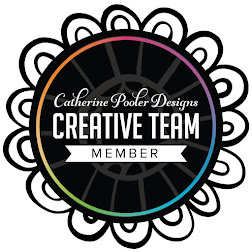 If you’re just starting out here, please hop on over to their site and get all the details – including how to win some fun prizes…including a gift card to The Ribbon Resource! Nothing says spring to me like stems popping out of the ground and growing nice and green! I really look forward to having my coffee on these spring weekend mornings, then puttering outside in my flower beds, weeding and being excited to see what has come back after the long winter. I stamped and fussy cut two coffee cups from the Lil' Inker Designs Coffee Talk Stamp Set (with various to-go toppers) on a nice mixture of ribbons and trims perfect for cardmakers: natural burlap string, olive green leaves and adhesive scallop borders. The Ribbon Resource offers so many colors in each of these, but if you need "just the right color", utilize items you already have on hand to change any light colored trim: alcohol markers, sprays/mists and ink, etc. all work! 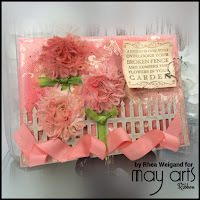 My card design was geared by Scrapbook.com's March Cardmaps Challenge. After my coffee cups were finished (I colored them with Copics and patterned paper), I adhered patterned paper onto a card base and created a tag from Lil' Inkers Anytime Tags 2 Die Set. I stamped the sentiment and then started accessorizing with ribbon. I hope you enjoyed my card, and thanks for stopping by! I'm on Instagram too-come follow me there and here on my blog! I hope you have fun hopping! There is a house on my way to work that has the most gorgeous plot of poppies. I can't wait to see them bloom again. 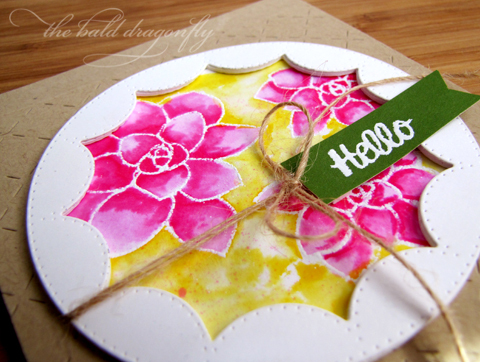 I tried out the technique Dawn showed on Papertrey Ink's Make it Monday: Sponged Stamping. I like the technique, but I think the next time I try I will have to go with different colors. 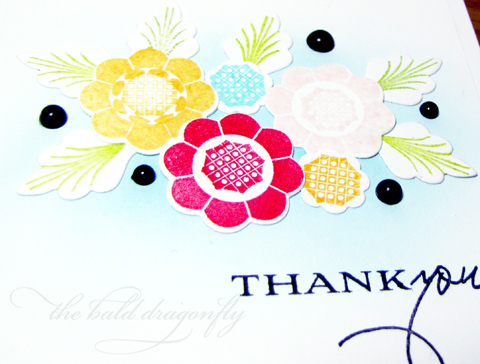 I used Botanical Silhouettes, the only solid stamp I have from PTI. 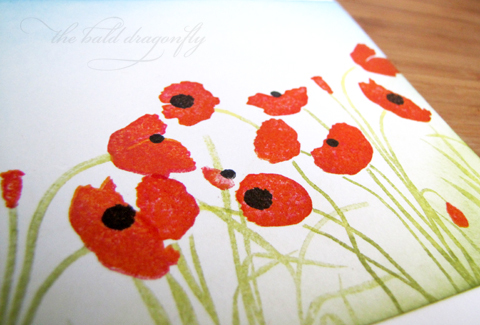 I inked the top of the poppies with Festive Berries Distress Ink, and the bottoms with Fired Brick. 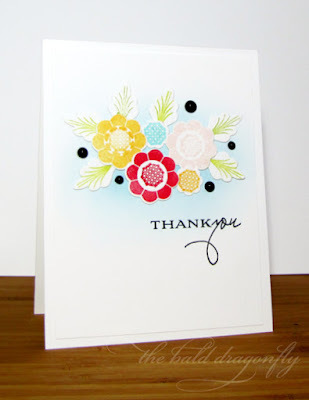 Thank goodness for the MISTI to help lining the stamps up! There isn't that much of a contrast, but it was fun to try! The stems and grass were inked with Squeezed Lemonade on the top and Peeled Paint on the bottom. I inked the top of the panel with Peacock Feathers and the bottom with Pealed Paint. 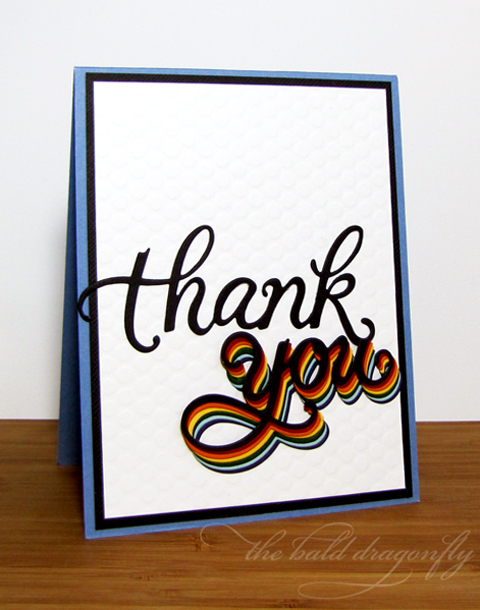 I adhered the panel to a white card base and stamped a sentiment to finish it off. 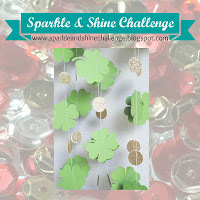 St. Patrick's Day is fast approaching and I made a card to celebrate! The outside is black and white, as you see here, but the inside...well, the inside has a surprise! 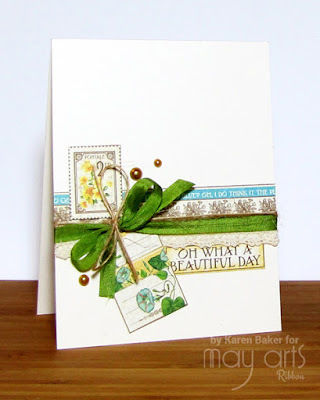 I would love for you to stop by the May Arts Ribbon Blog to see the whole card. 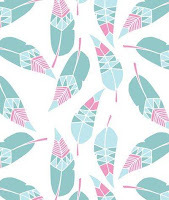 The inspiration picture of floating patterned feathers at The Pinterest Inspired March Challenge was just to amazing to pass up being inspired by it. I started my card by embossing an aqua panel with chevrons then adhered it to a white card base. 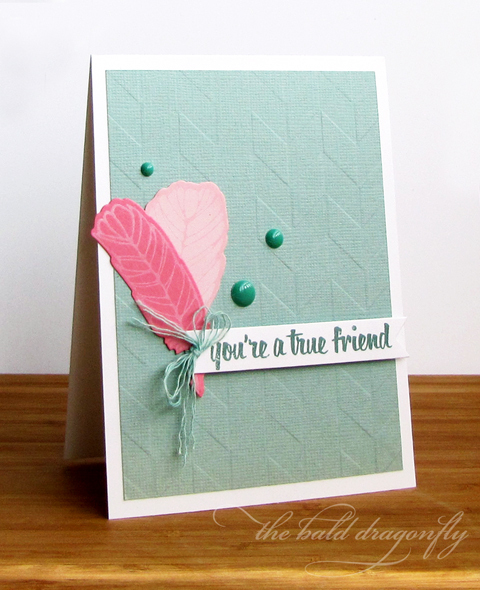 I then stamped some feathers onto two shades of pink paper and die cut them. I tied them together with the colored part of some aqua baker's twine. 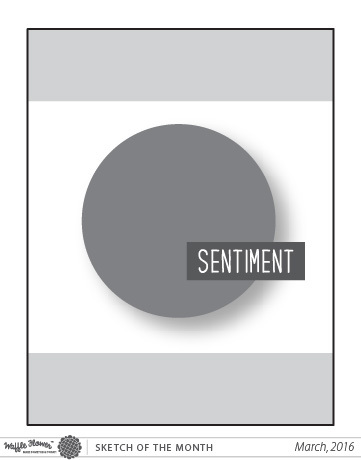 I then stamped a sentiment onto a white die cut banner and then arranged these two items onto the card. I finished with some darker aqua enamel dots. The Ribbonistas at The Ribbon Resource were given a challenge...to create something inspired by a May Arts Project that fans picked out! I created a magnet. 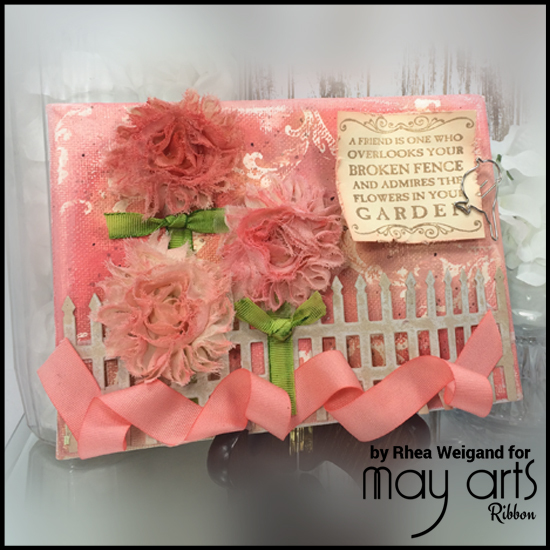 I started with a cardstock and fun foam base out of the solid die from the Lil' Inkers Quilted Flowers Die Set, then sprayed one of the 2.5" Sheer/Frayed Flowers in White with pink spray. I die cut and stamped some leaves from Avery Elle's Laurels Stamp and Die Set. 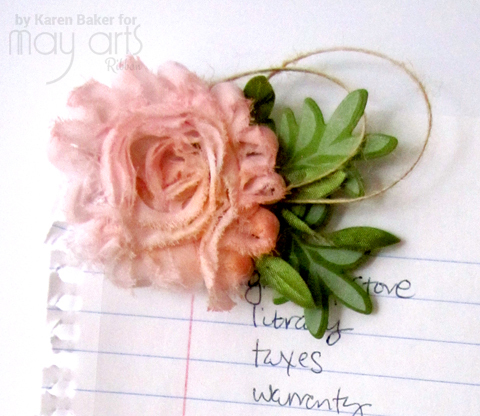 After letting the flower dry, I adhered the paper flowers to the base with glue, added two loops of Natural Burlap String and some Olive Green Leaves, and then adhered the flower to the base too. I added a magnet on the back! So easy and a lot of fun...bringing it to my office to decorate those boring gray filing cabinets. 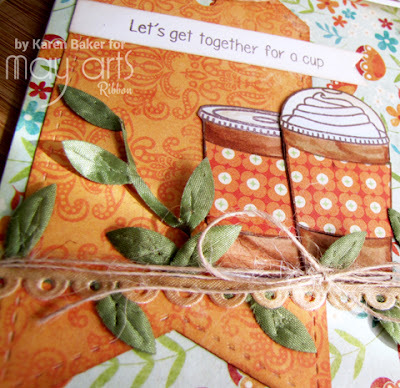 I invite you to stop on by The Ribbon Resource Blog to see all the other fabulous projects! I hear there is also a giveaway that just *might* involve fabulous ribbon too, so you may to check that out! You know what's great about creating your own cards? In your wold, flowers and plants can be any color that you want them to be! Therefore, welcome to my blog where I feature pink succulents. 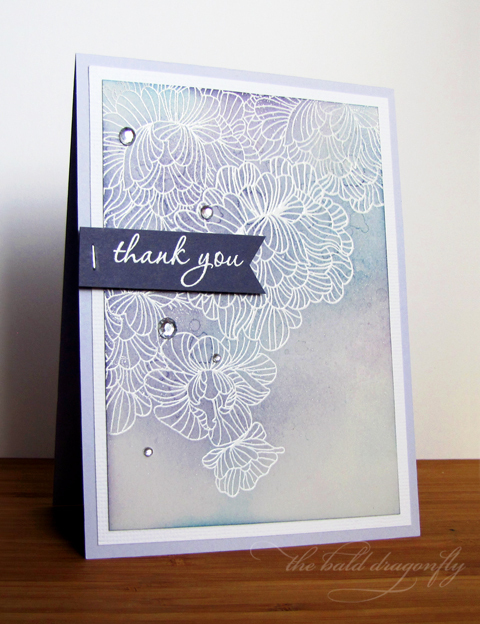 I started this card by embossing a kraft card base with a some stitched lines and then enforced their borders with scored lines. I tried my hand for the first time to color some images with Zig Clean Color Real Brush Markers. The images are from Waffle Flower Succulent Stamp Set and were embossed with white WOW! Embossing Powder before coloring and watercoloring. I've got a lot to learn, but it was still fun. I then added some yellow and pink flecks. 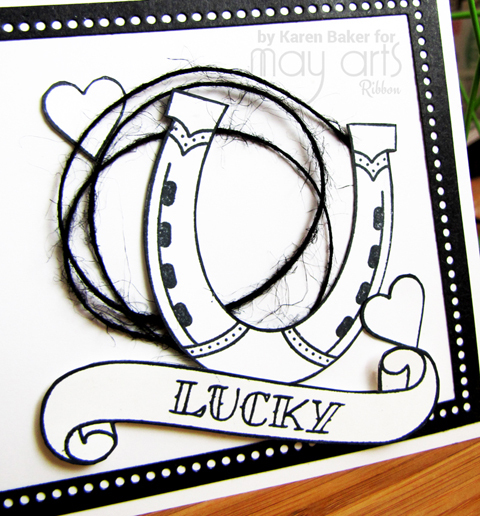 I die cut the beautiful decorative circle in both white cardstock and foam (look at the detail on that die, so pretty!) adhered them together and added that on top of the colored image. 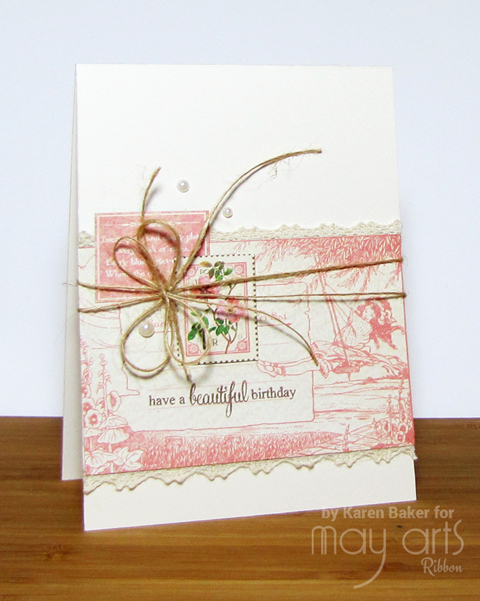 Before adhering to the card, I wrapped the panel with some Natural Burlap Twine from May Arts. Then I finished the card with an embossed sentiment. Here's the image and sketch I was inspired by at Waffleflower Crafts Monthly Challenge, which also offered me the chance to watercolor with my new Zigs, and I'm also playing along with the WOW! 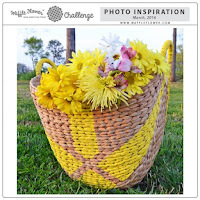 Monthly Challenge: Anything Goes. Gotta love a good pun... I needed a few boy birthday cards, and this stamp and greeting from Paper Smooches fit the bill. 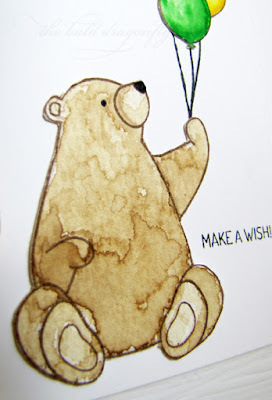 This card started out with a water-colored image, and I jazzed it up a bit with some gold glitter sparkle glue on the ground and a star on top of the groundhog's party hat. 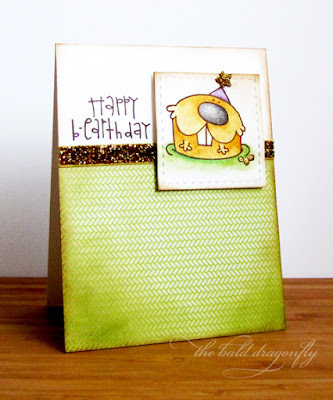 I die cut the image and added it to a card base that was partway covered with green patterned card. I added a strip of May Arts Gold Glittered Ribbon and then stamped up the sentiment in parts. I am usually "scared" to add glitter to my projects, but the challenge at Sparkle & Shine: 25 really inspired me. I'm also entering this into the Paper Smooches Monthly Challenge: Birthdays.